Cold Weather Smoking: Baby Back Ribs | ThermoWorks To help a metal smoker maintain its temperature and save on fuel usage, insulate it. There are products available for covering smokers during the winter to retain heat. Some avid smokers use hot water jackets or welders’ blankets for insulation. Be sure to wrap your smoker with flame retardant material. Lighting the Coals. It will take longer than normal for the smoker to get up to temperature in cold weather, and you’ll need to use 1-1/2 to 2 times as many coals as you normally would. Hardwood lump charcoal burns hotter than brick charcoal and can be a lifesaver in maintaining cooking temperatures in cold weather. If you use only wood for fuel, be sure to use wood that you know is completely dry. Dry wood will burn hotter and more readily. Consider keeping your wood and charcoal indoors to keep the wood warm and dry. It requires less energy to heat room temperature fuel than cold fuel. Have a kettle grill with coals going so you have fuel ready and waiting for you. 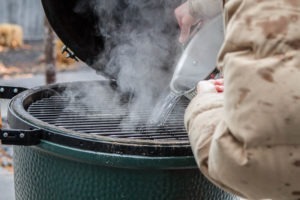 Ventilation Adjustments: A consistent flow of oxygen is necessary to fuel the coals, but any air flowing through your smoker in the winter will be cold, and can quickly cause the temperature to drop. Some people recommend keeping your bottom vent open as much as you would any other time of year but close the top vent a bit more than you normally would to keep the ambient temperature from cooling too much. A vent fan is helpful to keep the fire going. It can be a very helpful tool in maintaining a steady flow of air while the top vent opening is kept open as little as possible. Use boiling water to fill your water pan. Starting with hot water will help conserve the thermal energy in your smoker’s cooking environment, speeding your cook time. Bring meat to room temp. Reduce smoking time by starting meat at 70 degrees rather than 40 degrees. Keep the Lid Closed: Heat is lost very quickly any time the lid is opened—especially with a metal smoker—and the cooking temperature can take quite some time to recover. Opening the lid unnecessarily will prolong the length of your cook and use more fuel. Ceramic smokers will recover the temperature faster because of their heat-retention properties, but even with these cookers, it is best to only open the lid when absolutely necessary. Use simple recipes that don’t require multiple lid-opens. You don’t want to be opening the lid to flip or spritz the meat repeatedly. We chose baby back ribs for our cold weather smoking project because it’s at the quick end of the BBQ cooking-time spectrum. Some people will smoke a brisket or pork shoulder for about 6-8 hours and finish cooking in the oven. Temperature Tracking: The need to balance ventilation adjustment for winter conditions and keeping the lid closed at all costs make tracking temperatures accurately absolutely critical. Smoke™ For The Win! A dual-channel, leave-in probe thermometer like Smoke is the ideal tool for the job. You can monitor both the pit and meat temperatures at the same time on one device, and its wireless receiver is priceless during the winter so you can keep an eye on your temperatures from the warmth of the indoors. You’ll only go outside to add more fuel to the smoker or to verify the meat’s pull temperature once the high alarm sounds. Gateway to the rescue. Not only can you rely on the receiver to keep you out of the cold, but you can also trust the Smoke Gateway to monitor temperatures not only from the comfort of your fireside, but also from the store, the office, or the ski slope. The Wi-Fi Gateway sends your current temps to the cloud where you access them by means of our free app (available for Android or iOS). 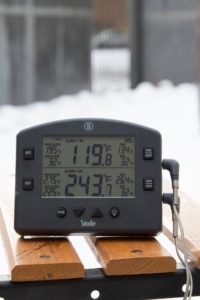 Q: Can my thermometer handle winter weather conditions? A: YES! The operating range of 32–122°F (0–50°C) as stated in the specs for Smoke, ChefAlarm®, and DOT® is important for long term storage and care of your products. But for the duration of a cook, your ThermoWorks alarm thermometer can withstand rain, snow, and temperatures well below freezing (32°F [0°C]). Cook to Temperature: Allow for 20–30% more time, but it’s most important to gauge your meat’s doneness by its internal temperature, not by how long it has been in the smoker. Keep the Finished Meat Hot: When your meat is done, be sure to bring it inside on a heated platter and cover with foil or a lid to protect it from the cold, wind, rain, and snow when transporting indoors. You can warm the platter in a low 200°F (93°C) oven. 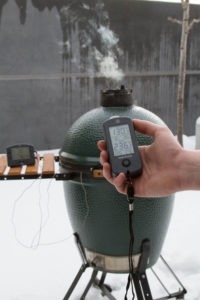 Test Run: Some experts recommend a dry run to figure out how to best manage your smoker’s temperature before adding meat to the equation. This way you can learn the tips and tricks that work best for your weather and cooker. Baby back (or loin back) ribs are not to be confused with St. Louis style spareribs. ➤ Spare ribs are taken from the bottom of the ribs—on the side of the belly of the pig. This is why they are bigger, meatier, and a little tougher cut of meat. 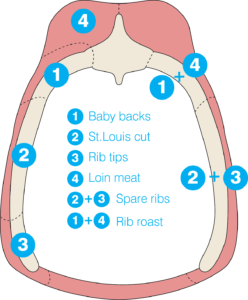 ➤ Baby back ribs are taken from the top of the rib cage—close to the loin of the pig. This is why they are a smaller (shorter) and more tender cut of meat. Note on Cook Time: Our cook took about 9 hours from the moment we lit the coals until the ribs were sliced and ready to eat. Definitely longer than it would take to cook ribs in the summer! Plan ahead to allow enough time for your full cook. Add lit coals to your smoker using about 50% more coals than you normally would during warmer months. 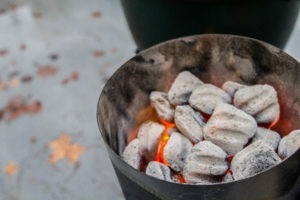 Add wood chips or chunks to the coals and close the lid. It may take quite some time for your smoker to come up to cooking temperature in cold weather (possibly 1 to 1-1/2 hours)—plan for a lengthy process. 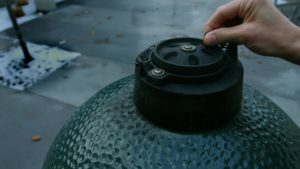 If you’re using a ceramic smoker like a Big Green Egg, it will take quite a bit of time for the ceramic to absorb and retain enough heat to maintain the temperature you’re aiming for. But later on, all the retained heat will maintain a steady temperature for the duration of the cook. 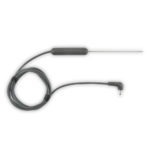 Secure a Pro-Series® Air Probe with a Grate Clip. Set Smoke’s cooker channel’s low alarm to 220°F (104°C) and the high alarm to 255°F (124°C). 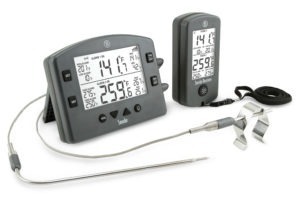 Keep an eye on your smoker’s temperature with the wireless receiver or the Smoke Gateway while you prepare the ribs. No running out into the cold weather to check your temps! 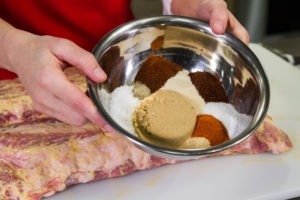 Mix together spice rub ingredients together evenly and set aside. Trim any excess fat, and remove the membrane that covers the bone-side of the ribs, and pat dry with paper towels. If desired, slather the ribs with mustard, then generously apply spice rub to all sides. Using a Pro-Series Waterproof Needle Probe, place the probe in the center of the rack between two bones in the center of the meaty area. Place the ribs on your smoker’s grill grate meat-side up and close the lid. Attach the needle probe to Smoke’s other channel. Set the high alarm for 170°F (77°C). Maintain an even temperature by adjusting your cooker’s bottom and top vents as necessary and add fuel as needed. 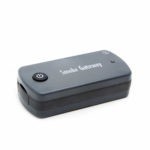 Smoke’s wireless receiver is priceless for smoking in cold weather! Stay warm while you track your temps. This part of the cook may take around 4 hours. When the meat’s high alarm sounds, verify the internal temperature with an instant-read thermometer like a Thermapen Mk4. If a lower temperature is found in your rack of ribs, replace the needle probe so it’s tracking the lowest temperature, close your smoker’s lid and cook until the high alarm sounds. Once the internal temperature is verified, remove the rack of ribs from the smoker and disconnect from Smoke. Take the ribs inside for the next step. Arrange two layers of heavy duty foil large enough to wrap the rack of ribs. Slather 4 ounces (1 stick [113 grams]) of butter on the foil, sprinkle down some brown sugar, drizzle honey and tiger sauce. Lay the ribs down on the sauce ingredients meat-side down, and repeat the same ingredient application on the top of the ribs. Wrap ribs securely. Return wrapped ribs to the smoker and cook for 1 hour meat-side down. Pull ribs from the smoker, unwrap and return to the smoker (meat-side up) to “set” the glaze that has developed on the ribs while they were wrapped. Replace the needle probe and set Smoke‘s high alarm to 190°F (88°C). Cook until the ribs’ internal temperature reaches 190–195°F (88–91°C). 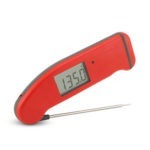 Be sure to verify the doneness temperature with a Thermapen Mk4. This portion of the cook may take 1-2 hours. Pull from the smoker and rest for 10-15 minutes. Brush the whole racks with your favorite barbecue sauce, or leave them as-is. Cut the rack by slicing between each rib bone. Be sure you have plenty of napkins nearby and enjoy! With expert advice and the right temperature tools, BBQ season doesn’t have to be confined to the months between Memorial Day and Labor Day. If you’re an all-weather pitmaster, or just craving a taste of summer to chase away winter blues, plan ahead and track your temperatures for a successful cold-weather barbecue. Thanks to our affiliates for their input and expert advice! Tiger Sauce “is an exotic, moderately spicy blend of Ingredients in a cayenne pepper base. With a touch of sweet and sour, it’s perfect for meats, seafood, and poultry. Delicious on sandwiches, in dips and soups.” It’s usually available at WalMart located near the BBQ and cajun sauces. cooking and stuff would be different. The tips with cold weather smoking apply to electric cookers too. Insulating your smoker, extra fuel, and extra time are the main tips you’ll need to be aware of. Read through Meathead’s post on Cold Weather Grilling and Smoking for more specific tips and pics of insulation techniques. I’ve been smoking and enjoying Baby Back Ribs for years. Nothing wrong with what you are describing, but I find temp monitoring of the meat is hit or miss with ribs as the bone makes up so much of the total mass, it’s hard to gauge done-ness with a meat probe thermometer. Instead, I use a digital probe thermometer to watch my pit temps, but gauge when they are done by the “bend test”. You know the ribs are done when you pick them up from one end of the rack (use an insulated BBQ glove) and the meat just cracks between the bones. If there are no cracks cook a little longer. If they break off they are a bit over done, but will be tender and delicious anyway, just not optimum. I also have used the 3-2-1 method at times (3 hours in the smoke, 3 hours in foil (texas crutch), and 1 more hour unwrapped to firm up), which works well for SDt Louis or spare ribs, but the baby back ribs are usually overdone by following this age old advice. Lately I’ve just been forgoing the foil wrapping altogether on babies, and shooting for about 5 hours of total time on the smoker. I do flip and flop my ribs as my smoker is not completely uniform in heat distribution, but that also gives me time to check using the bend test for done-ness. The BBQ pitmaster’s best friend is a false cambrio. This is just a place to put your meat in when it is done that will hold it hot for a long while but not continue cooking. I use a dry picnic cooler and wrap the ribs in foil first, then several large old bath towels as insulation. I can hold the cooked ribs for up to 5 hours without them going cold or overcooking themselves. Give it a try!